We have a Kodak EasyShare camera C533 and printer which needs a new cartridge. Do you sell them? If not, could you recommend where does? Sorry, the cartridges listed here are only compatible with a Kodak EasyShare 5000 printer. The Kodak C533 camera connects to a printer Dock 6000 or Dock series 3 which uses a PH-40 ink and paper kit. Unfortunately, we no longer supply the Kodak PH-40 ink so you'll need to contact Kodak directly to check on the availabilty of this item. I have a Kodak EasyShare printer and cannot get cartridges for it. I only know that it's an "IImage Link Print System" with no number on it. Can you suggesst a replacement please? If we don't list your exact printer model or ink cartridge number on our website, then we're not able to supply the cartridges that you require. We would recommend that you contact Kodak directly, or your printer supplier for this information. Hello, we're trying to identify the cartridge we require to replace our now empty one. We have a Kodak EasyShare printer dock but there is nothing in the literature that came with the package or on the printer dock to tell us what type it is so we cannot specify what ink cartridge to purchase. The camera that goes with the printer dock is a Kodak CX7525. Can you tell us what cartridge we should buy, the only mark on the existing empty cartridge is '40 Kodak'? Regards, Tony Frost. Since the cartridge you were using previously is marked '40 Kodak', I believe the pack you require is a PH40. Unfortunately, we discontinued this item last Summer. I believe that Kodak were still selling the pack for a short while but I would recommend contacting them to see if they're still selling the pack or if they can recommend a replacement as we no longer supply them. I want to find cartridges and paper for a Kodak EasyShare printer dock? As far we're aware, these printers and the consumables for use within them have been discontinued. Please contact Kodak directly for further assistance. The Kodak EasyShare 5000 series is one of the most versatile and reasonably priced MFP lines in the market. The series offers all-in-ones that are able to print, scan, and copy at good speeds and are powered by advanced inkjet systems. Pictures come out in as fast as 28 seconds (fast draft, 4x6-inch) while black text documents are produced at a rate of 32ppm. Colour prints are not far behind at 30ppm. 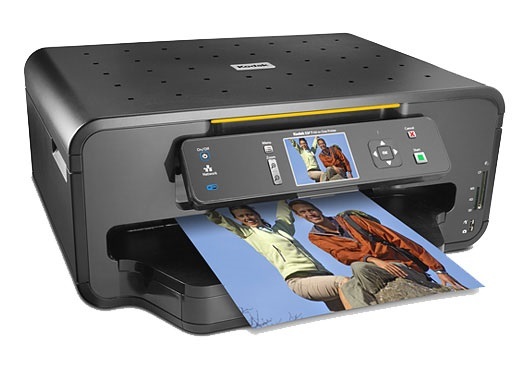 The Kodak EasyShare 5000 offers wireless printing via Bluetooth but doesn't have networking capabilities, which is often a standard in MFPs targeted at office settings. Units from the Kodak EasyShare 5000 measure about 18.8x16.4x11.3 inches; they are compact, considering they have bulky components like an automatic document feeder and an auto duplexer. The Kodak EasyShare 5000 series also has a large control panel with a colour LCD display, suspended over the front-yielding paper tray. There are slots for several types of memory cards, along with a PictBridge port for connecting to compatible cameras. In addition to speed and quality, the Kodak EasyShare 5000 also scores high in useful accessories like the ADF and auto duplexer. The copier can reduce and enlarge documents at 1% increments (between 10%-500%), and the scanner can scan up to 8.5x14-inch documents with the help of the ADF. The Kodak EasyShare 5000, however, does not support wireless connectivity, except through Bluetooth. It is not network ready, either. For most average home settings, though, printers from this line are practical and more than ample.